How Can You Convince Your Family To Eat Healthy During The Holidays? How can you convince your family to eat healthy during the holidays? Family and friends get together to share gifts, stories... and food! Here are valuable strategies to continue enjoying the holiday food and still be healthy! TOPIC: How Can You Convince Your Family To Eat Healthy During The Holidays? During the holidays family and friends get together to share gifts, stories... and food! This is the time of year that the recipes of ultimate temptation start showing up as well. What strategies have you used in the past, and did they work? What new strategies will you try to get your family to eat healthier? Bonus Question: When you made an effort to improve the quality of how your family eats, were there any problems and were you able to solve them? To use your credit, e-mail Justin @ justin.podzimek@bodybuilding.com for more info. View This Author&apos;s BodySpace Here. This is a tough task for any family, but in my case, there&apos;s an extra challenge - we&apos;re Italian. In my grandparents&apos; and my mother&apos;s eyes, food equals love, and the more of it the better. The bottom line, though, is that every family wants to show each other how much they care during this time of year, so you can gently remind them that helping each other stay healthy is a great way to show your love. Is A Great Way To Show Your Love. Moderation is key, and the healthier you are, the more time you&apos;ll get to spend together in the long run. Another way to convince them is to explain that if they don&apos;t want to eat healthy for themselves, they are doing it for you and everyone they know - remembering that you&apos;re all in it together can help create success. While Halloween candy, pumpkin pie, and the whole gamut of Christmas treats aren&apos;t exactly healthy, there are many ways to provide some damage control. [ Click here to learn more. ] Halloween&apos;s Scary Cheat Meal! A lot of websites offer recipes for healthier versions of holiday treats, but even if you can&apos;t find one, you can make your own - subbing apple sauce for oil, egg whites for yolks, Splenda for sugar, Smart Balance for butter, and peanut butter instead of trans-fat laden frosting are simple ways to make things healthier. This is huge! While I recognize the importance of eating healthy, there is no "dirty" food if you exercise in moderation. It&apos;s okay to indulge in your favorite treats as long as you keep it under control. Your 12-Week Daily Video Trainer - Week 4: Portion Sizes! You&apos;ve always wanted to get in the best possible shape, but you&apos;ve just been waiting for someone to help you make that first step and keep you moving down the right path. Kris Gethin is your own Daily Personal Trainer! Today we&apos;re talking about the importance of meal portion sizes. Using smaller plates, cutting smaller portions, and putting the food on a separate table can help with this. This has been more successful, as no one wants to be denied the food they&apos;ve waited all year for. You&apos;d be surprised how much power your brain has - smaller plates make people think they&apos;re eating more, and having to walk away from people to get more food can be off-putting. In addition, separating courses helps - instead of piling chocolate on top of whipped cream on top of ice cream on top of pie, serve them separately. [ Click here to learn more. ] 3 Valuable Dining Tips For Portion Control! Overeating is a vice that can be easily conquered once you know the difference between a proper portion and the mountain of food most restaurants serve. A health teacher once told me that what you think are hunger pangs are sometimes really just your body telling you that it&apos;s thirsty. For this reason, I have encouraged my family to drink lots of water and always keep bottled water around all the time. Everyone has embraced this, so I&apos;d say it&apos;s been a success. [ Click here to learn more. ] Staying Hydrated: What You Need To Know! Read on to discover five tips to help keep cool in the heat. A lot of my older relatives are big soda drinkers, so swapping out diet soda for regular soda will help them save a significant number of calories, and the taste difference is mostly negligible. Lower-fat milk and light beer are also possibilities. Instead of making the focus of the gathering the food, remind everyone that getting together and catching up on things is the most important part. Keeping people talking will help keep everyone from putting so much in their mouths, and setting up board games will add something else to look forward to. If the weather is nice, an after-dinner walk seems like a great idea. Taking along a camera to take pictures of the changing leaves and snowscapes can be fun and also help burn calories. Another fun activity would be a pickup football game. Instead of sitting around watching the pros, playing a game amongst the family is entertaining and a great source of exercise. Football In The Off-Season. - By J.P. 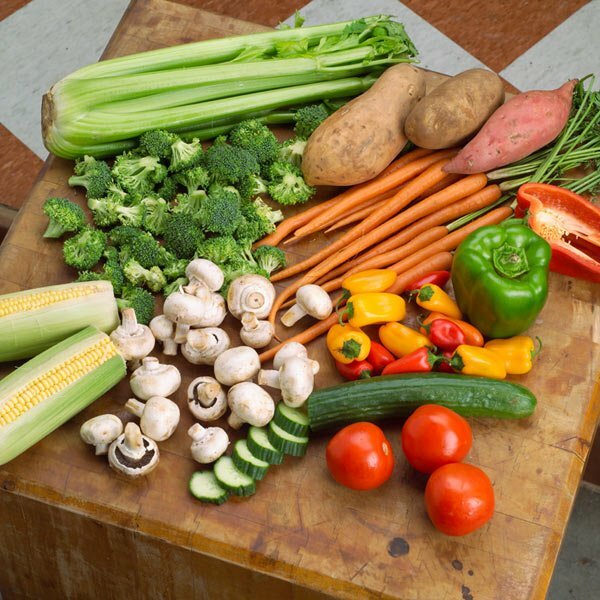 Serving calorie-sparse foods such as steamed vegetables or salad before the main course will help people fill up and prevent them from getting stuffed on the less healthy foods. Fill Up On Healthy Foods. 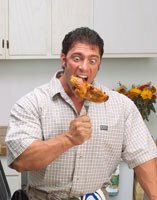 When You Made An Effort To Improve The Quality Of How Your Family Eats, Were There Any Problems And Were You Able To Solve Them? In the past, my Dad has been the biggest stickler. Growing up on whole milk and full-fat treats, he&apos;s been a bit stubborn. However, we have successfully reached compromises, adopting 2% milk instead of whole or skim, and frozen yogurt instead of ice cream. [ Click here to learn more. ] Should You Drink Milk? If you&apos;re like most people, you&apos;ve been raised on cow&apos;s milk and probably continue to think that it&apos;s a healthy food that&apos;s a staple of the bodybuilding diet. In addition, we have explained that we&apos;re not trying to deprive him of good food, we&apos;re trying to make sure we don&apos;t deprive ourselves of him by compromising his health. Convincing your family to eat healthy during the holidays is one of the hardest things you can get them to do. They feel this is a time where family should get together and talk about the past year. It is a time where relatives come from a variety of places to bring their favorite dishes and desserts for us to enjoy. How can you turn down a plate of mouth-watering turkey with mashed potatoes, macaroni & cheese, potato salad, and a piece of pumpkin pie? It is hard, but it takes a commitment from all. The three big days (Halloween, Thanksgiving, and Christmas) challenge our mind. It is tempting, but you can do it. I convince my family to stay healthy by reminding them of the importance of a "sound body, sound mind". Many people gain 10 to 20 pounds during the holiday season and wonder how they got it. I just tell my family that the smaller children in the family are looking up at you. They see us as role models. If we pig out and eat everything in site that is not good, then they would follow our foot steps down a role which includes bad eating habits and overindulging. Moderation is the key when it comes to anything, so just remember that. [ Click here to learn more. ] Tis The Season: Tips To Stay In Shape! You will enjoy the holiday gatherings even more when you have no feelings of guilt from over-eating and the depression some feel afterwards. Here are a list of strategies I used that benefitted me and kept me healthy. My brother also took part in this in an effort to stay fit and healthy during the holidays. Breakfast is the most important meal of the day and eating a good one will prevent you from destroying those yams during Thanksgiving lunch. If your Thanksgiving meal is around dinner time, make sure you have an adequate breakfast and lunch. Sometimes we feel we are hungry, when in reality we are not. Drinking water throughout the day during Thanksgiving can help eliminate some of the "hunger" you feel you have. Water fills you up and this inevitably will have you eating less. Holiday dinners are tempting, as you see all of your favorite foods and desserts on the table. This does not mean pile your plate high and eat until your stomach is full. Eat like you have some sense. Eat Like You Have Some Sense. I am pretty sure after eating the main course and sides, you want a nice slice of pie. Keep that in mind, because everybody loves desserts and there are others who want to eat at the table. We all have relatives who want you to taste their latest creation. If you do not want it, just say no. People stop going to gyms around this time because it&apos;s too cold or the weather is that severe and prevents them from leaving. This does not mean you should stop working out. Working out before a big Holiday meal is one thing everybody should be doing. Cardio and weight training as a matter of fact will speed up that metabolism and burn off those calories. If you don&apos;t have time before the meal, set aside time after to walk or weight train. Use our calculators to find out for over 600 exercises and activities! Those the strategies above are nice, there is one strategy I failed to incorporate. It is probably the most important. You may have smaller portions, but your plate will still be full of high fat, high cholesterol, and high sugar monsters. Try to find low-fat recipes for pies. 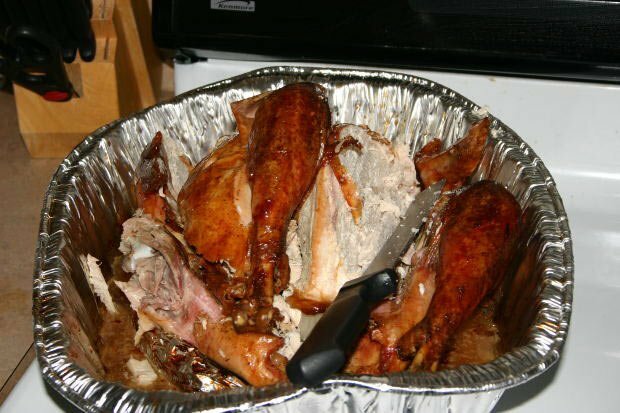 Take the skin off that turkey. Stop slathering all that gravy and butter on those mashed potatoes. [ Click here to learn more. ] Recipes For The Health Conscious Consumer! These recipes range from Nutty Dressing and Old Fashioned Meatloaf to Roasted Zucchini And Squash. Let&apos;s not forget about those liquid calories. Don&apos;t drink too much alcohol, carbonated drinks, or eggnog. Those drinks can add up and many people fail to count that as part of nutrition. If your the person who is cooking all the food, then you have the opportunity to set an example that will not only be healthy, but still delicious. Obviously, you can&apos;t tell some of your older relatives what they should and should not be eating. Though you can enlighten the little kids on healthy eating habits and things of that matter. Do You Think You Can Get Older Relatives To Change Their Eating Habits? It Would Be Difficult But It Could Be Done. I&apos;d Have To Pester Them Quite A While First. No They&apos;re Extremely Set In Their Ways. Eating healthy starts earlier and the younger you start the easier it will be for people to learn and understand it. It is just like kids being able to learn a language faster than an adult. Holidays are a stressful time for many people and coming together as a family will liven those sprits. Encourage positive dialogue between yourself and your family about issues of the past year. Motivation is the key. I am the mom of a 10 year old boy and a 5 year old girl. I am the Chief Chef at our house and have learned many different cooking techniques that get the healthy foods into them (as best I can!). With the upcoming class parties and family celebrations, they have learned to eat sweets in moderation and to add fruits and veggies as snacks. 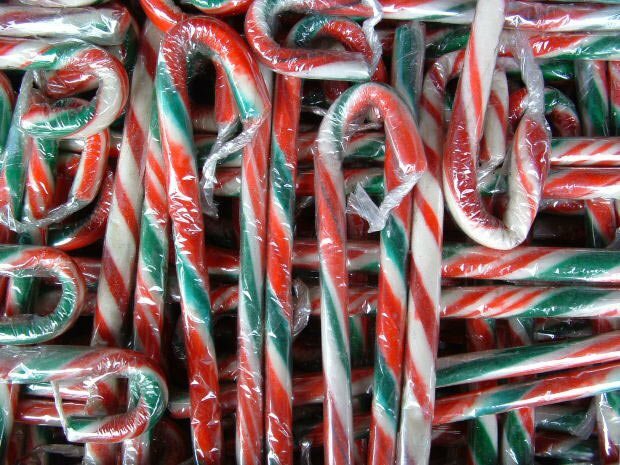 Plus I&apos;ve become an expert at getting rid of the many candy canes that invade our home and linger until Easter! 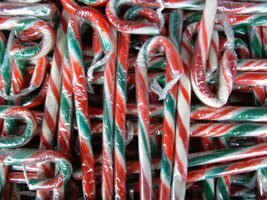 Many Candy Canes That Invade Our Home. They never miss the candy once it&apos;s buried in the trash. My husband already knows what&apos;s good for him and not so good. He&apos;s really not too bad! I am teaching them to make smart food choices by example and putting healthy foods out for them to eat. My mom and I used to make a bunch of candies and cookies starting in late November. However, it is my dad and his conditions, that really didn&apos;t need to eat the treats we made. Yet he was the biggest consumer of them! Two years ago, we said, "No more! No one needs to eat this crap." We had been giving out some of it as gifts and taking it to family parties. At first, other family members were actually mad my mom didn&apos;t make her famous Coconut Bon Bons. She simply told them she didn&apos;t feel like making them this year. Now I don&apos;t make any special treats that are incredibly fat-laden. [ Click here to learn more. ] Preparing A Fatty-Tasting Thanksgiving Meal Healthfully! Here&apos;s a step-by-step plan for keeping your holiday meal full of flavor, but not full of calories. 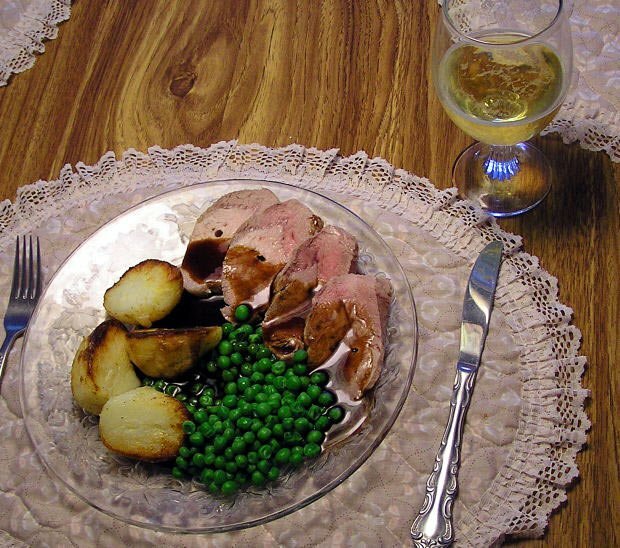 If a party host requests a dish to pass, it is something truly sinful tasting, but not bad for you. At home, it&apos;s simple exchanges - cottage cheese for the milk in mashed potatoes; light or fat-free condensed milk and Splenda in the pumpkin pie; steamed veggies with butter spray instead of casseroles. One of my favorite strategies was for last year&apos;s parties, I offered to bring salad. Now this was no ordinary salad but a mini salad bar! I had the greens in a large bowl along with smaller bowls with healthy additions in them. Plus my collection of wonderful salad dressings that most people won&apos;t try. It was a huge hit! You could make your salad however you wanted it! The VitaMinder Salad Chiller makes it easier for you to eat more nutritiously during your on the go lifestyle. It keeps your salads and vegetables cool through a freezable ice pack that snaps into the bottom of the lid. I have already started searching for new healthy recipes for the holidays. I&apos;m thinking of making my own rolls this year instead of buying some packaged ones made with HF corn syrup and other ingredients I can&apos;t pronounce. I&apos;m also going to add vegetable purees to some dishes where I can. I am also stocking our house with healthy choices for those after school snacks. As with most kids, mine are not very adventurous when it comes to their food. We have a 2-bite rule in our house - you must try 2 bites before you say you won&apos;t eat something. [ Click here to learn more. ] Power Foods For Your Backpack Or Lunch Bag! Here are a variety of tips and solutions that will help you! Try them now... your mind will thank you! My daughter swore she didn&apos;t like my beef burgundy until she actually tried it. Then she exclaimed how much she loved it! And then there&apos;s the, "It&apos;s a seasoning." line I like to use when they question what the green "stuff" is in different dishes. In reality it&apos;s broccoli or spinach - just chopped fine. I try to be the example and eat healthy and my kids (and hubby) see that. So do my family and friends. I&apos;m often asked how I eat and can I teach them. That is so rewarding!